"This year 120 new and hard to find beers! Every year in the last weekend of March, Le Gothique hosts a beer festival. 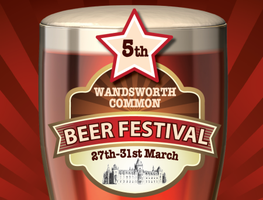 The Wandsworth Common Beer Festival showcases regional and micro breweries from around the country. The dramatic setting in the Grade II listed Great Hall and gardens together with food from Le Gothique restaurant make this a festival with a difference. An excellent opportunity to visit a piece of history on your doorstep. More indoor seating this year. Live entertainment on Friday and Saturday night!" When - Weds 27th - Sun 31st March.